A native of Clarksburg, WV, Jeff received his undergraduate degree from Lenoir-Rhyne University in Hickory N.C. and his law degree from the West Virginia University College of Law. 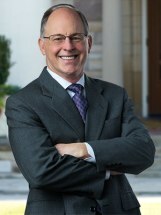 He began practicing law in Charleston in 1986 with the nationally known law firm of Preiser and Wilson, which later became Hunt and Wilson. Prior to joining Farmer, Cline and Campbell, Jeff was in solo practice for 16 years. Jeff is the Past President of the West Virginia Association for Justice and was named Member of the Year in 1999. He is also the former editor of the Association’s magazine “The Advocate”. He is also the past President of the Lenoir-Rhyne Alumni Association and was the recipient of the Moretz Alumni Award for Service to the Alumni Association in 2006. Jeff has been named one of the Top 100 Trial lawyers in West Virginia by The American Trial Lawyers Association and has been ranked as one of the Top 10 Personal Injury Attorneys in West Virginia by the National Academy of Personal Injury Attorneys. He is also a member of the Million Dollar Advocates Forum, recognizing those lawyers who have either a million dollar verdict or settlement. He was named an Emerging Business Leader to watch in USA Today in 2012. He is the author of the best-selling book “Protect and Defend” and also authored “The West Virginia Automobile Accident and Injury Guide”. He has also appeared as a contributor on the national internet radio show Money for Lunch to discuss issues related to injury victims and insurance companies. Jeff’s practice is concentrated in the areas of helping victims injured in car accidents, wrongful death victims and their families and other personal injury victims. He also does trial work.